1930's Vauxhall car sales agency in Newcastle-Upon-Tyne. Homepage. This page: Attractively illustrated invoice for a 1930's Vauxhall garage, art deco in style. 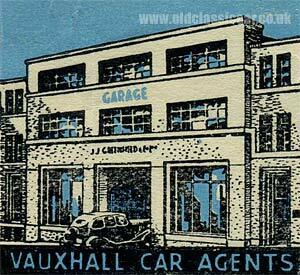 J.J. Greenfield - Vauxhall car agents in the 1930s & 1940s. 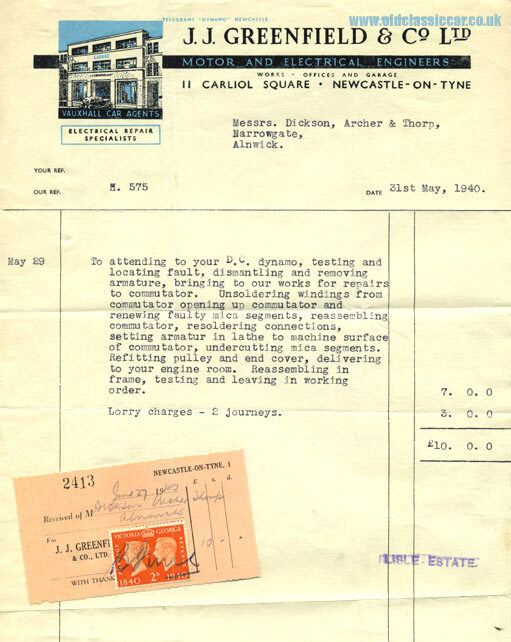 World War Two was well and truly underway when this invoice, issued by J. J. Greenfield & Co. Ltd. (Motor and Electrical Engineers), was posted to their customer, Messrs Dickson, Archer & Thorp (Alnwick), for repair work done to a vehicle's dynamo. As electrical engineers, such work would have been second nature to Greenfield's, the invoice describes the stripdown and repair work undertaken to the dynamo for which a total cost of £10 was billed, £3 of which was for two lorry journeys made by the garage. In addition to being motor engineers, Greenfield's was also a Vauxhall sales agency. An illustration at the top left shows the art deco-inspired design of their showroom, with a mid-sized Vauxhall driving through the entrance. The garage's address is given as 11 Carliol Square, Newcastle-Upon-Tyne. Contact with the garage could be in-person, via telephone (24479) or by telegram sent to "Dynamo" Newcastle. Dickson, Archer & Thorp was a firm of solicitors in Alnwick that only closed in 2003, nearly 300 years after opening its doors. Apparently the contents of their premises was a real treasure trove of old documents, shedding light on local people and businesses over the years. Chances are that this invoice had been stashed away at their office since 1940, and only came to light on the firm's closure. J.J. Greenfield's garage was, as already mentioned, located on Carliol Square in Newcastle Upon Tyne. A photograph of their building, taken in 1969, can be seen on Newcastle Libraries' Flickr page: J.J. Greenfield garage (external link). The building survives, alongside an entrance to a local bus station, but looks pretty sorry for itself if the image on Google streetview is anything to go by (link - RHS of photo). An invoice relating to another pre-war Vauxhall garage, this time in Alnwick, can be found on the W.Wilson Motor Engineer page.